In keeping with the festive holiday mood, I thought you might enjoy these photographs. 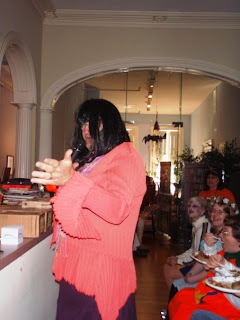 The first one is Willem Meiners, cute accent and all, sporting a black wig for Halloween 2008. Thankya, thankya verymuch! Or should that be, shoop, shoopy doo? And here she is thanks to a state of the art graphics program! Alice wasn't on this trip. In the larger version of the photo of Meiners, Alice, friends and the "hellocopter" you can see that the two added figures cast no shadow and seem suspended in space. 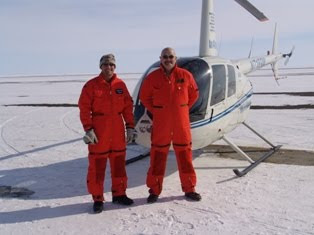 Alice has claimed to have been on the trip but she was not on it as proven by Meiners' previous stories of the trip and his blog detailing the crew. I suppose the cold weather gear worn by Alice, in the photo, was worn on the trip by Sig; who was on the trip and happened to be Meiners' wife at the time. The roundfaced girl sitting behind Meiners with glasses and what looks like a garland in her hair is the infamous Darcy Smittenaar. Many PA authors received nasty e-mails from this gal who was fired after she had a meltdown over royality calcuations. In real life she is a timid little thing who spends much of her time in role playing games and staying very close to her family. Yes, the infamous Darcy! lol. I recall that meltdown well. After the public rant, she quickly changed her tone to sing the praises of this company, but was fired anyway. Hmmm, working for the company, not THAT would make a great sting. If your request was granted, PublishAmerica would be denied, prematurely, any hope of recovering its expenses. This is why we would prefer to keep the contract in place until its expiration date. Your book is currently being carried by major wholesalers throughout the world, and listed by numerous vendors. Every bookstore in the U.S. and Canada has immediate access to your work. All this at PublishAmerica's sole and recurring expense. We still harbor a reasonable expectation that, at a minimum, your book will allow us to break even on our investment.